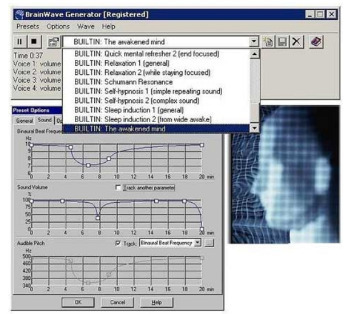 BrainWave Generator is a brain wave stimulation software that generates tones with binaural beats. Want to relax? Meditate? Learn faster? Focus attention? Increase your awareness? Try self-hypnosis? Just put on the earphones and let BrainWave Generator take you to the state of mind you want. The sound and visual stimulation functions of BrainWave Generator help you. In addition to using the more than 20 built-in brain wave entrainment programs, you can create your own programs (presets). This is because habits such as smoking and excessive drinking or eating are often unconscious ways to control one’s feelings and moods, for example, to alleviate anxiety. This is especially true in the case of drinking, as alcohol changes one’s state of mind quite noticeably and can create an illusion of relaxation.